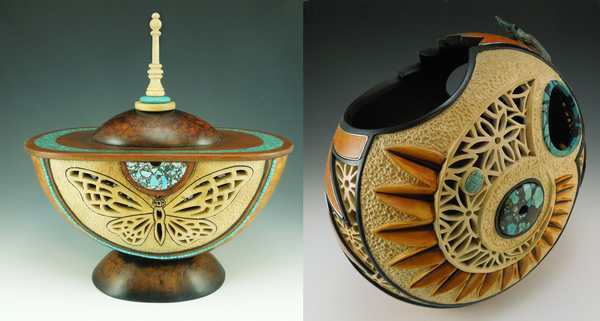 This class is perfect for those who want to learn how to get more out of a Dremel tool or other brand of rotary carver. In this class, you'll learn about using your power tool more effectively, and all about different types of burs and what they do. You'll learn techniques and will carve sand ripples, basic relief carving, and carving for inlay. Carving safety and types of equipment will be discussed. Bring a power rotary tool (Dremel or other brand) and any accessories you have on hand. Bring a gourd suitable for carving and your basic tool box. A mini jig saw may be helpful but is not necessary. Bring a dust mask. Bring a sack lunch. You will receive some inlay items to use on your project. Be ready for your class by ordering tools and embellishments directly from this site. 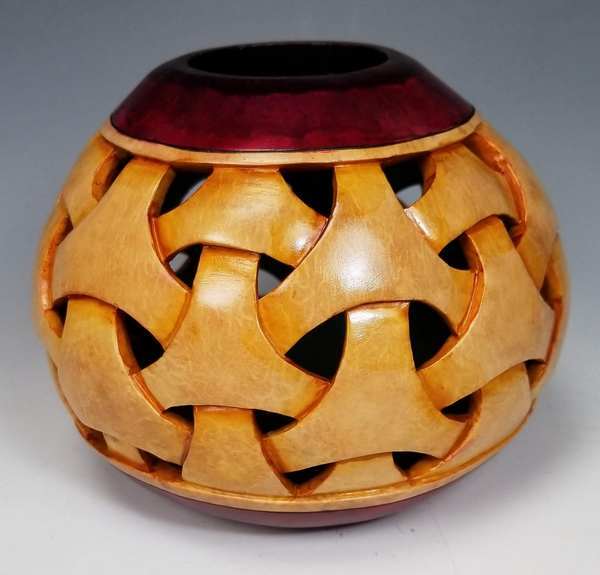 This class will introduce you to closed coiling techniques, including how to prepare your gourd for weaving, starting and ending techniques, basic wrapping techniques, adding additional colors and threads, and figure 8 wrapping. Learn how to recess an area to create a flowing "river bed". Add decorative bubble holes and small pebbles to complete the effect. (You'll also have the opportunity to use crushed glass if you prefer instead of pebbles). 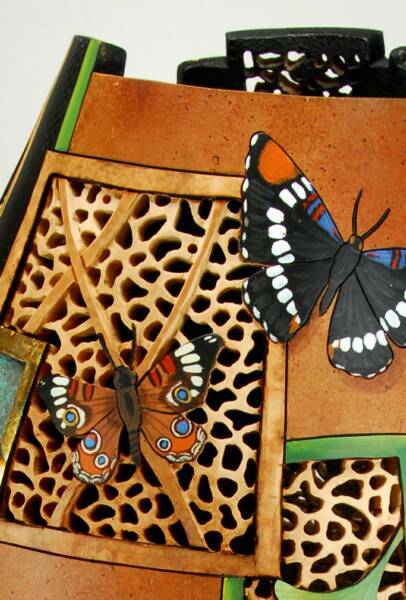 You'll finish up with an application of color and patina paints and oxidizers to accent the finished project. Students should bring a dremel, Foredom or other similar rotary tool and any burs you have on hand. Bring a small gourd (cannonballs and small canteens work great) and a good quality dust mask. 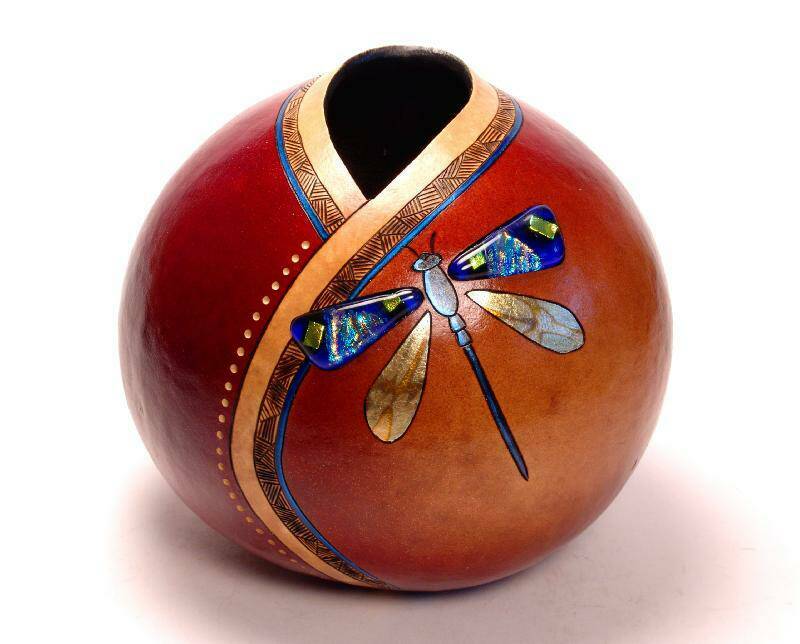 In this class you'll learn how to design and carve a section of "filigree" into the gourd surface and will have the option of adding design elements such as butterflies, dragonflies, etc. You'll try different carving methods and burs and should complete at least one section in class. Take advantage of learning from a master; I'll provide you with plenty of tips and tricks that will make the technique much easier and the finished project look good! Students should bring a gourd that is reasonably thick for carving. The gourd should be cut open, cleaned and painted inside (if desired) ahead of time. Bring a Dremel or other similar rotary tool, and any burs you have on hand. Bring a good quality dust mask. Riffler files and sanding sticks are helpful but not necessary. 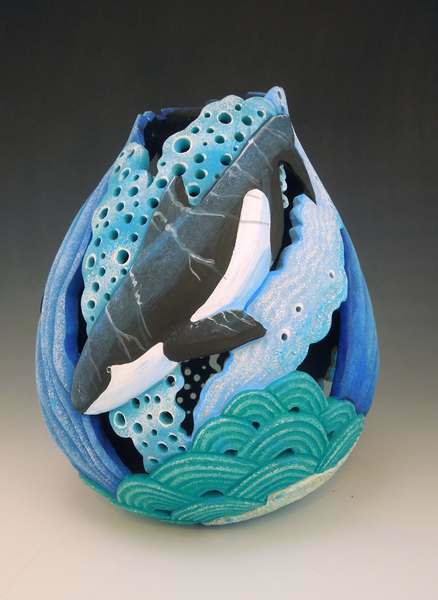 The Carving with Cutouts workshop is primarily designed for those that have taken a basic carving class in the past and/or feel comfortable with their power carving tools and the basic techniques, however beginners are welcome too.. You'll learn about designing, dimensional 3-D carving, and carving with cutouts. The class content focuses on how to see and design a 3-D pattern, and the design varies depending on the class interest and location. However, the class is taught in the same way no matter which design is offered. My classes encourage creativity - each person's gourd will be unique depending on their skills and interests. Vertical gourds in the 8" tall range work well, but we can work with what you bring. 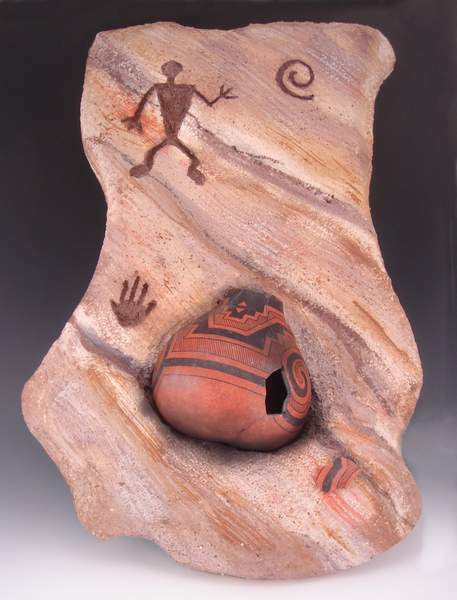 There will not be time to paint the gourd, this class focuses on carving techniques. Bring a power rotary tool (Dremel or other brand) and any accessories you have on hand. Bring a thick gourd suitable for carving and your basic tool box. A mini jig saw may be helpful but is not necessary. We will have some tools available for shared use. Bring a dust mask. In this class, you will receive two completed pieces of fused dichroic glass to use for inlay or wire wrapping. If you'd like to inlay your piece of glass, please bring a cleaned gourd and you will learn how to carve an opening to inset the glass. You also have the option of using your glass for a piece of wire wrapped jewelry. Instruction on this technique and basic materials will be provided. You will also create two small pieces of fused dichroic glass from provided materials. These pieces will be fired in a kiln at the conclusion of class, and will be returned to you at the next Tucson patch meeting or can be mailed to you if you are from out of town. A cleaned gourd and a dremel tool if you want to inlay your glass. Wirecutters, jewelry or needlenosed pliers for wirewrapping if you have them. A basic tool kit with xacto knife, pencil, sharpie marker, etc. Bring a sack lunch. Learn about some basic mask making techniques and create your own masterpiece. You will be supplied with a kit containing all the basic materials you'll need, including a half gourd, feathers and more. (You are welcome to bring and use your own special feathers, beads or other accessories if you wish.) I will provide different types of acrylic paints and stains, but you may bring dyes or inks if you would rather use those instead. A basic tool kit with xacto knife, pencil, paintbrush, dremel, etc. (Whatever basic tools you like to use at home.) A mini saw may be helpful but is not necessary. Bring a woodburner if you want to use one, and a sack lunch. 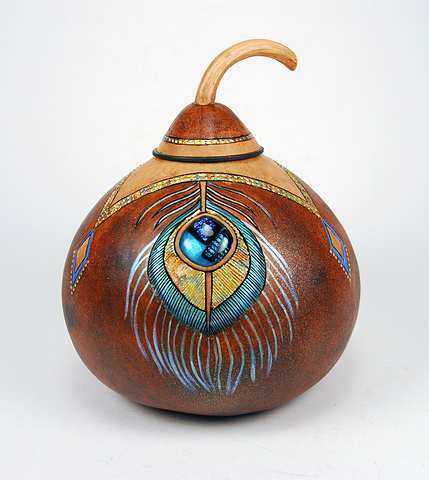 Learn to design and layout a gourd to use this technique effectively. Carving, woodburning and minimal use of paint will be used to create areas that will appear to be inlaid sections of coiled basketry. 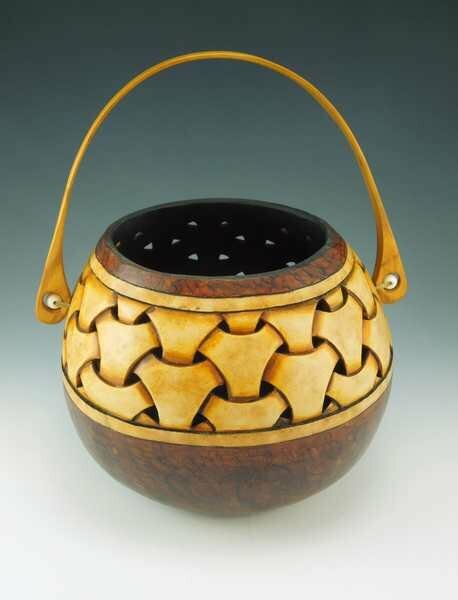 Students will learn the basketry technique only. Other decorative applications can be added as desired after class is over. Students should bring a dremel, Foredom or other similar rotary tool and any burs you have on hand. Bring a good quality dust mask, a woodburner and please bring a cleaned gourd that is suitable for carving. Paint will be provided. In this class you'll learn how to make a basic drum. You will have some choices as to style of drum and types of lacing and materials. Students should bring a gourd that is reasonably sturdy. The gourd should not flex easily when squeezed. Shape is not crucial, but it may determine the style of drum you will make. You will be provided with the proper size drum head, lacing and metal ring. Acrylic paints and sprays will be available, if you prefer to use inks or dyes you may bring your own. Bring a mini saw if you have one. 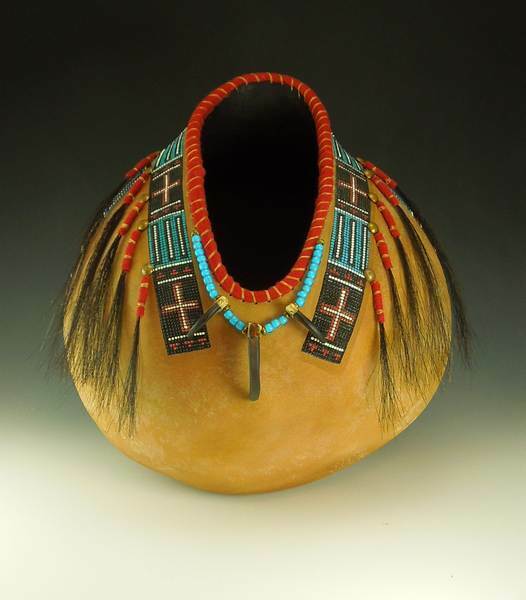 Create a Plains Indian style "Buffalo Robe" gourd that is embellished with inlaid or surface applied (your choice) beaded rosettes and faux beading. You will use a variety of painting techniques to create a distressed leather-like surface. Typical plains pictographs may be added if you wish. Beaded rosettes and paints will be supplied. You may bring your own brushes or fine point markers if you wish to use those. Bring a rotary tool and any burs you have on hand plus a good quality dust mask. Bring a woodburner if you have one. Bring a small gourd, cannonballs work well for this project. 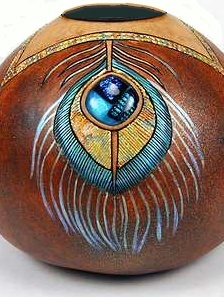 Inlay a piece of dichroic glass (provided) and create a striking peacock feather design on your gourd. 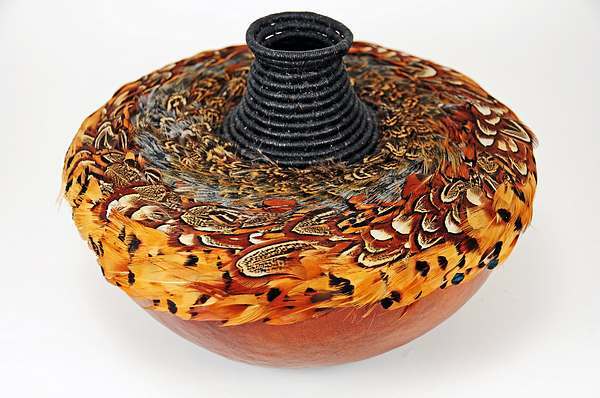 You'll use carving, woodburning, gold leafing and painting techniques to create a eye-catching peacock feather on your prepared gourd. Please bring a gourd that has been cleaned and prepared. The irridescent effects will be most striking if you dye or ink your gourd with a dark color before class. Cannonballs and small vase shaped gourds are good choices. One piece of glass, gold leafing and paints will be supplied. You may bring your own brushes if you wish. Bring a rotary tool and any burs you have on hand, a good quality dust mask, and a woodburner with a skew or similar tip for burning lines. This is not your typical class! Instead, this is a chance to enjoy a relaxed atmosphere and to finish gourd projects that you have started during earlier workshop classes, and just need a bit of help or inspiration to carry you through to the end. I will work one on one with everyone to make sure they get just the help or ideas they need to "get over the hump" and finish those projects that just need a bit more time and attention. *Note - this session is intended to help you finish partially done, already started projects. There won't be time to teach you brand new techniques you've never tried before. Bring whatever project(s) you want to work on and any special tools you require. Here is something a bit different - and it's suitable for beginning to experienced gourders. 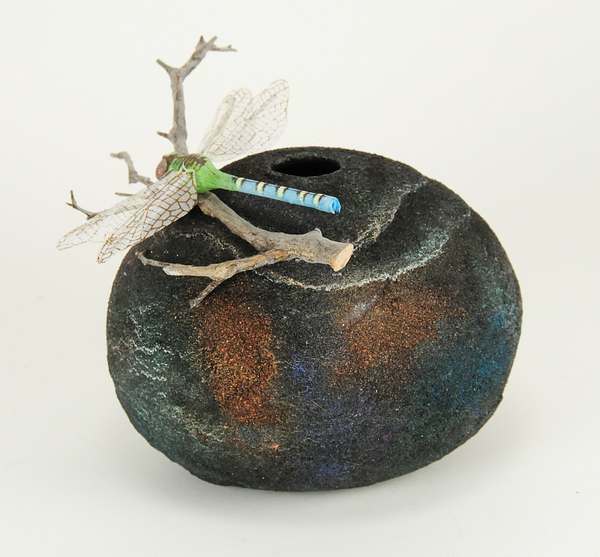 Learn how to make a faux - raku style gourd (with or without carved accents depending on your skill and interests) and finish it off with a decorative twig and a flying critter such as a bee, butterfly or dragonfly. If you have one, bring your dremel tool and carving burs to add a carved accent. I will provide faux painting supplies, twigs and critters. Wear old clothes. and bring gloves if you don't like to get paint on your hands. Students should bring a Dremel, Foredom or other similar rotary tool and any burs you have on hand. Bring a good quality dust mask, a woodburner with a pointed or skew tip, and please bring a cleaned gourd that is suitable for carving (at least 1/4" thick is preferable). 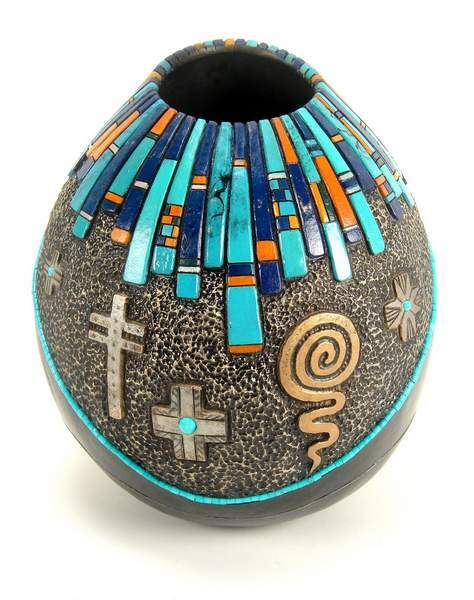 Inspired by Southwest Native Pottery, this class has a mix of carving and painting techniques. First, you'll carve your gourd to create the appearance of 3-D overlaid shards of pottery, and then use a variety of painting techniques to complete the illusion. To save time in class, please bring a gourd suitable for carving that has been cut and cleaned ahead of time. Almost any gourd shape is OK, but you will get more of a dimensional effect if the gourd isn't too thin. Bring a rotary tool (Dremel or other brand) and any carving burs you may have on hand. Bring a dust mask. I will supply a few small turquoise cabochons as well as paints. I have paint brushes and painting sponges for class use, but I recommend that you bring your own good liner brush. My brushes have been used by many students and are not great for fine detail painting. Wear old clothes. and bring gloves if you don't like to get paint on your hands. 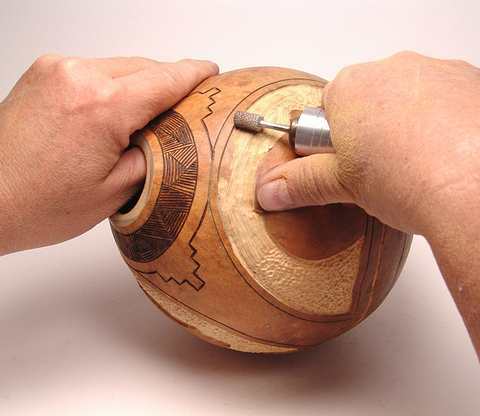 In this class you will learn the basics of using a power rotary tool to carve on gourds. 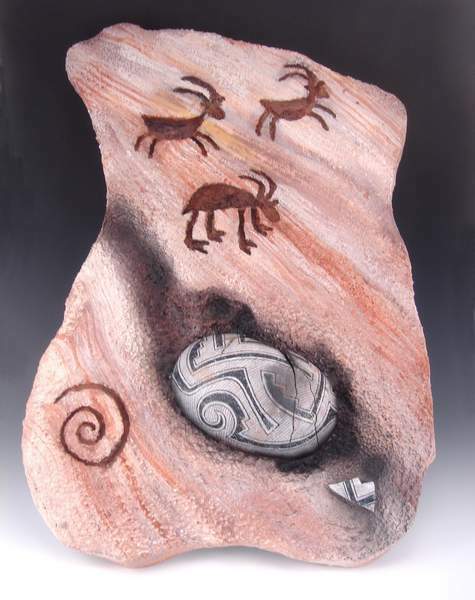 Students will carve "sand ripples" and then learn decorative sponge painting techniques with Petroglyph designs to complete the gourd. Demonstrations of additional techniques such as heishi inlay and gold leafing will be presented. Students should bring a dremel, Foredom or other similar rotary tool and any burs you have on hand. Bring a good quality dust mask. You may also bring your own paint brushes, sponges or paints if desired. Students will be supplied an oil candle insert, heishi and painting materials. Gold leafing will be discussed but you will be responsible for providing your own if you wish to use it on your gourd. Bring a small gourd (at least 4" tall) that sits reasonably well and will be solid enough for carving. Cannonballs, small pears or other rounded gourds with no neck are best. 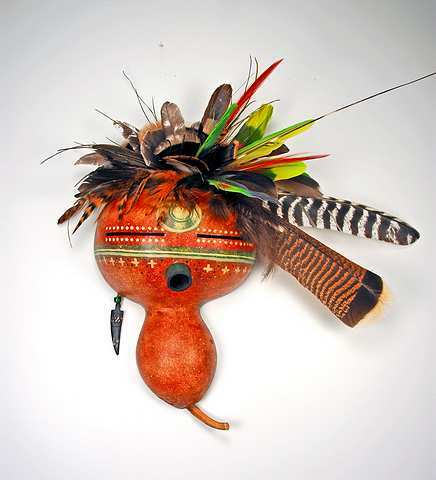 Learn to create and properly fit a lid made from a gourd scrap and wood pieces. Students will learn the lid making technique only. Other decorative applications can be added as desired after class. Tool use will be taught, and ideas for creating decorative handles will be covered. Students should bring a cleaned, UNCUT gourd. The best gourds for this class are canteens, cannonballs, or other rounded gourds. (Gourds with necks are much more difficult to use and should be avoided.) Bring scrap cut off tops that can be used for the lid - if possible, bring a variety of sizes and shapes so you will be able to choose the best one. .Wood parts will be provided. Bring a good quality dust mask, a dremel tool and burs, and a full sized power drill if you have one. You will also have a chance to use other full sized saws and sanders. Bring a power rotary tool (Dremel or other brand) and any accessories you have on hand. Bring a cut open and cleaned gourd suitable for carving and your basic tool box. Bring a woodburner if you have one; I have a few for shared class use. Bring a dust mask. not finish the gourd during class time. Bring a power rotary tool (Dremel or other brand) and any carving burs you have on hand. A cut and cleaned gourd suitable for carving, and a dust mask. It's a functional rattle - but it's also a mask you can hang on the wall! 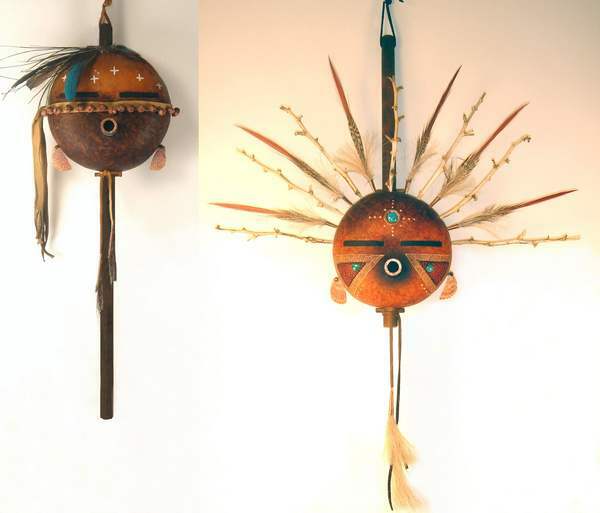 Learn construction techniques for making these southwestern style rattles, then add your own touches to make the rattle into a decorative art piece. You will be provided with a rattle handle and some embellishments. (You may also bring special embellishments of your choice to make your finished project unique.) Basic water based dyes and paints will be available for shared class use; if you have special dyes, inks or products you prefer, please bring your own. Suggested tools: Bring a rotary tool and burs if you want to add carved designs. Or, bring a woodburner - your method of decoration is up to you. We will use a cordless drill with a 5/8", 1/2" and 1/4" drill bits - I have some for shared use if you don't have these. In this class, you'll learn how to combine coil weaving with the addition of small feathers for a fun effect. You'll learn the basic coiling technique and how to prepare individual feathers for weaving. Most of the instruction will take place in the morning, and the rest of the day you'll work on your project and enjoy the time visiting with your fellow weavers. We will take a short lunch break - so bring a sack lunch. 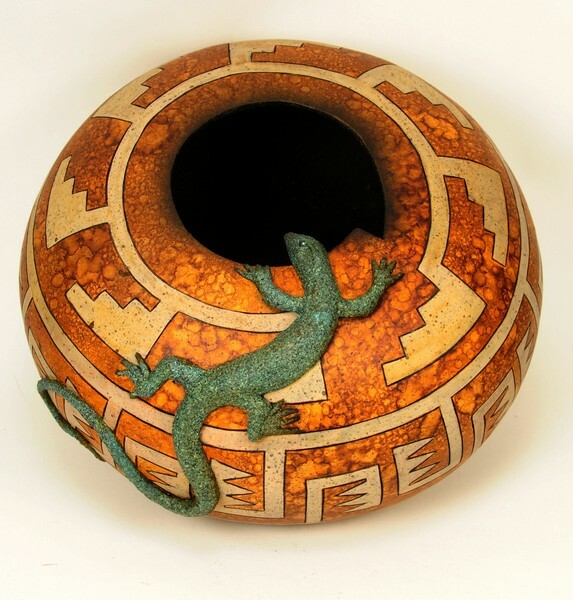 Bring a gourd bowl that is cleaned and finished inside and out ,and is ready for coiling. 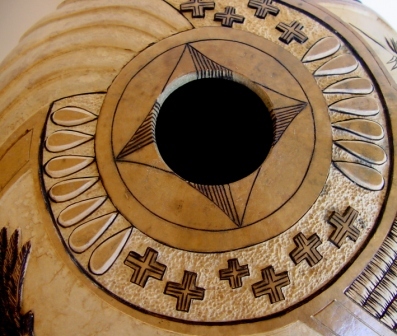 The opening of the gourd bowl should be approximately between 5-8" in diameter. (We will drill the small holes to attach the weaving in class.) Also bring a spool of waxed linen (any color, your choice ). I will provide the inner core material, tapestry needle and feathers for each student. Learn to inlay crushed glass as a decorative effect, and combine it with woodburned (or drawn) doodles in a fun composition. Students should bring a cleaned gourd. Any thickness, shape or size is fine - and perhaps you'd like to experiment and use this technique to embellish a mask or spirit doll! Choose from a variety of design ideas. Bring a good quality dust mask, a dremel tool and burs, and a woodburner. . I will supply the crushed glass in a variety of colors and some basic dyes/coloring products. We will take a lunch break. In this class, you'll make a rock art wallhanging complete with a piece of ancient gourd "pottery". Your wallhanging can be up to approximately 2 ft x 3 ft; you choose the size and shape! Please wear old clothes - this can be messy. If you have them, bring a propane or butane torch, and a soldering iron or soldering iron style woodburner. An old kitchen knife, a Pitt Pen and old beat up paint brushes both large and small are also suggested. The instructor will have some of these items for shared use. Bring a sack lunch.It's hard to determine exactly how long your project will take - but you should finish it in class. 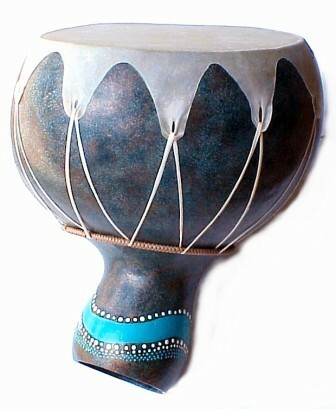 Hear the soothing sounds of ocean waves lapping on the shore when you play this drum! 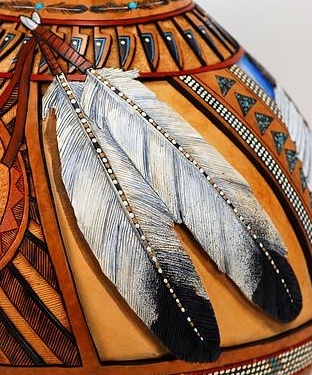 In this class, you'll prepare and decorate your gourd shell with ocean related designs, and add a goatskin rawhide drum skin and rim. All supplies are included in the cost of the class including a prepared gourd. Note: The photo is just a sample - everyone's finished piece will be unique! 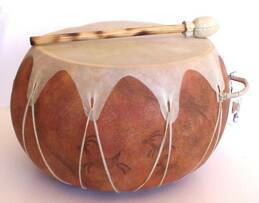 Provided supplies include a skin, decorative trims and tacks, sound effects material, and paints/dyes to create your drum. Bring a a pair of scissors and (if you have): wood burner, staple gun and/or small hammer. You are welcome to bring small shells or other items for embellishment purposes. Class paint brushes will be available for shared use, but you may prefer to bring your own. Bring a brown bag lunch. This is an example of what you will be able to make during our class. Your design will vary. You will learn how to carve and paint faux precious stone jewelry effects, and faux textured metal effects. Inlaid heishi and stones and inlaid wire effects will be shown - but are optional. We will carve in the morning and paint in the afternoon - bring a sack lunch and we'll take a break between the two techniques. Learn how to carve a gourd to resemble a Cholla cactus skeleton! Along the way, you'll experiment with an innovative "rotary chisel" bur to create different and interesting textures. This is a technique class. All students will work at their own speed. 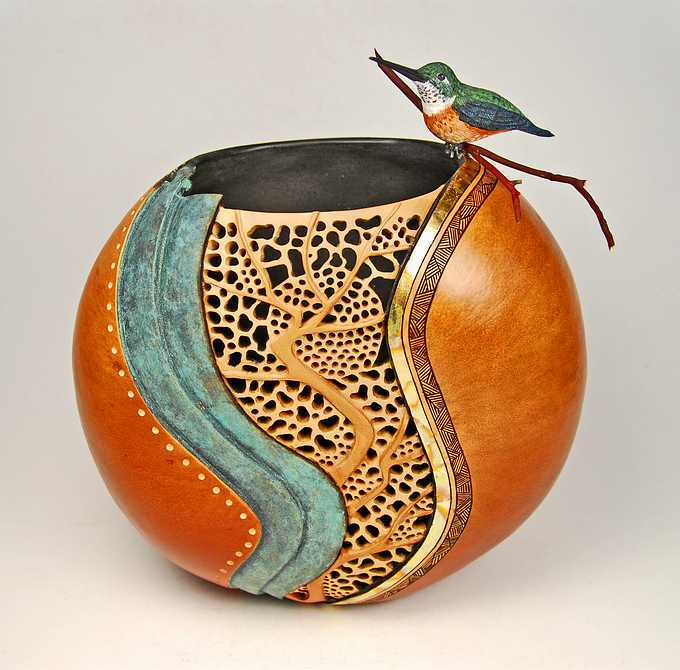 Painting and added embellishments such as handles and clay will be discussed by the instructor, but are not part of this class. Students should bring a gourd cleaned inside and out. Any shape is fine - but bring one that is at least 1/4" thick after cleaning. Avoid gourds that are really large, as you will not have time to finish a large piece. Something that is 6" or less in diameter is preferred. Bring a good quality dust mask, a dremel tool and burs, and any small hand tools such as files or sanding items you may have on hand. Bring an xacto knife and a pencil. Take your filigree carving to a new level! In this class, you'll learn how to lay out and execute some new and innovative filigree type designs. Emphasis is placed on developing skills to enable you to create new and more advanced designs in your future projects. You'll learn some tips and techniques to give your carving a more finished and professional appearance. Students should bring a gourd cleaned inside and out. Any shape is fine - but bring one that is at least 1/4" thick after cleaning. Avoid gourds that are really large, as you will not have time to finish a large piece. Bring a good quality dust mask, a dremel tool and burs, and any small hand tools such as files or sanding items you may have on hand. Bring an xacto knife with a NEW SHARP BLADE and a pencil. This combo class will show you how to securely attach handles that are functional as well as decorative. (You may also use the same technique to add an extra gourd neck and give your gourd an interesting pottery shape.) 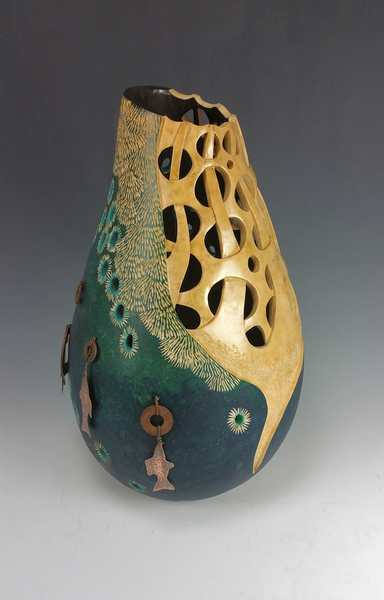 Next, the gourd will be textured with a variety of materials, and coated with a real metal patina finish. Students should bring a gourd cleaned inside and out. Any shape is fine, but avoid gourds that are really large. One that is 6-8" or less in diameter is preferred. Bring a good quality dust mask, a dremel tool and burs, and and a 1/2 - 1" paintbrush. If you own a heat gun, please bring it. Other materials will be supplied in class. Examples of handles, added necks and patina finish - your gourd will be unique! 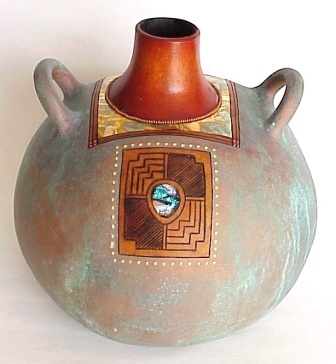 Enter and submit your email address to join the Arizona Gourds newsletter mailing list. Paints and basic embellishments of your choice will be provided. Bring a gourd, a woodburner and your basic tool box. You may be drilling some holes or possibly insetting some embellishments, so a dremel may also be handy but is optional for this class. Preferably, the gourd should be taller than it is wide, but we can work with whatever you bring. 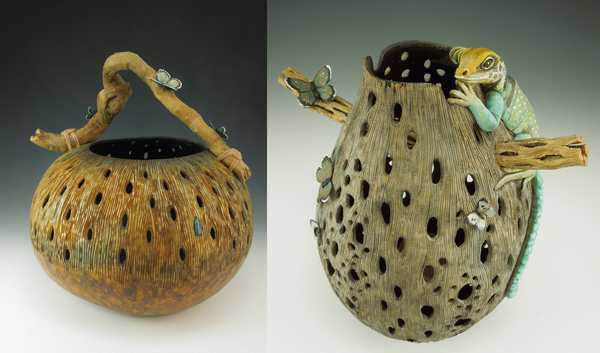 Please bring one that is not really small, larger gourds work well for this project. We will take a lunch break, so please bring a sack lunch. ould be able to finish your gourd depending on how complicated you choose to make it. You will be provided with a center stone or concho, and will decide on what decorative spirals you want to wrap around it on the gourd. You'll have a choice of a variety of carved and woodburned patterns to choose from, as well as some different finishing techniques you can choose from. The photos are just examples, everyone will make something unique. Bring a power rotary tool (Dremel or other brand) and any accessories you have on hand. Bring a woodburner, and bing a gourd that is not huge. Something in the 5-7" range is probably best if you want to finish your piece in class. Bring a dust mask or purchase one at class. Finishing supplies will be available for class use, but you are welcome to bring your own inks/dyes/brushes, etc. if you prefer to use your own. 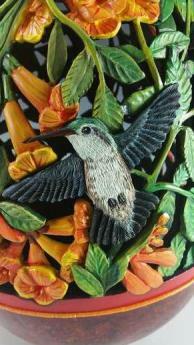 Suitable carving burs, tools and other supplies will be available for purchase at class. 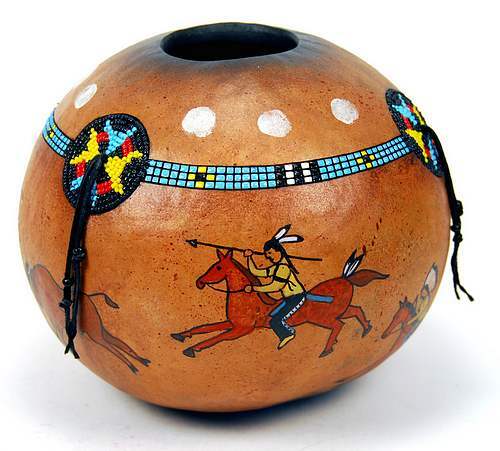 This gourd can be as simple or as complicated as you wish - but we will focus on carving and burning at least one pueblo lady and her stylized pueblo village behind her. 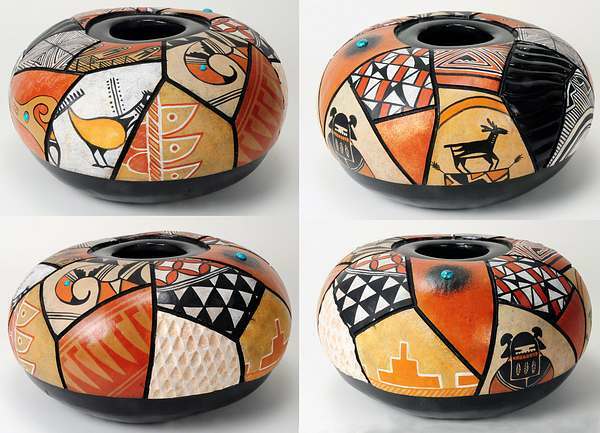 Other details such as ripples, added gourd pottery are an option; you can be creative so that your gourd will be unique. How much you add depends on your own taste, talents and time! 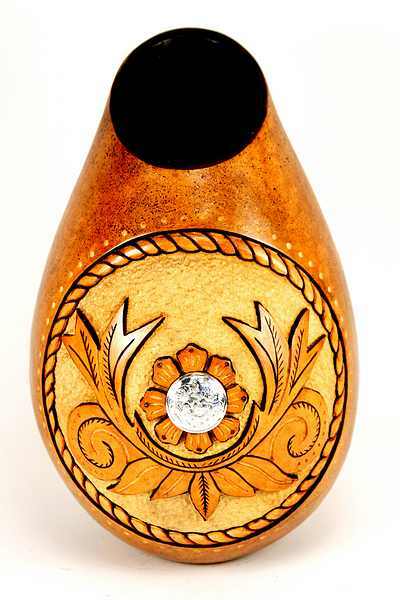 You will be provided with cabochons to decorate up to 3 ladies, and one gourd pot. Sample Design - No painting in this class, just carving instruction. This class will expose you to several contemporay design concepts. Like all of my classes, everyone's finished gourd will be personalized and will look different! You'll learn some new techniques and should go home with a finished or near finished piece. Flowers are the theme, but composition and techniques and some new ideas will be the primary focus. I will provide some materials and finishes to use on your project, but you may also bring your own dyes/inks/paints if you prefer. You will also need to provide your own gourds - Bring one that is cut open and cleaned inside and out. Other openings will be made in class. Do not paint the interior. Also, bring a few smaller gourds that can fit inside the larger gourd. We will learn how to cut the openings and select the correct size - but you will want a few to choose from during class. Not a gourd project this time - but the pine needle weaving skills you will learn will transfer to future gourd projects. 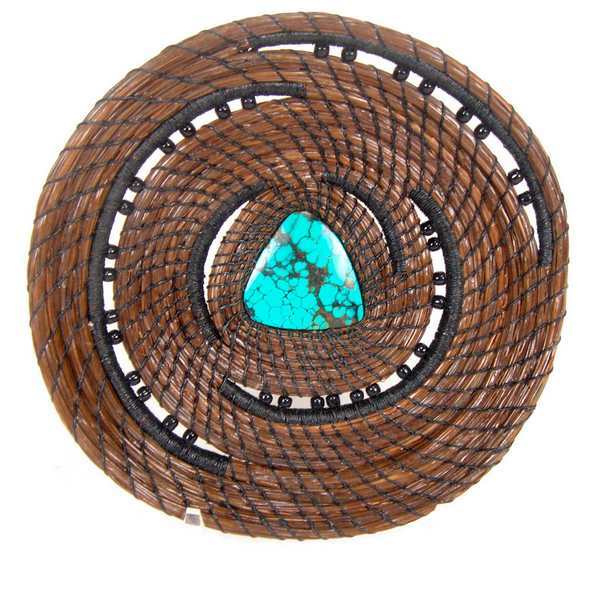 This basket will be woven around a center cabochon (provided). Each student will receive a bundle of southern long leaf pine needles, ready for weaving. You'll also receive a small roll of artificial sinew, a center cabochon prepared for use, and a sewing needle. Bring an old kitchen sized towel, a pair of small scissors and a small pliers. Bring a sack lunch. If you prefer to use waxed linen or your own special beads, bring those with you. Bring a power rotary tool (Dremel or other brand) and any burs you have on hand. 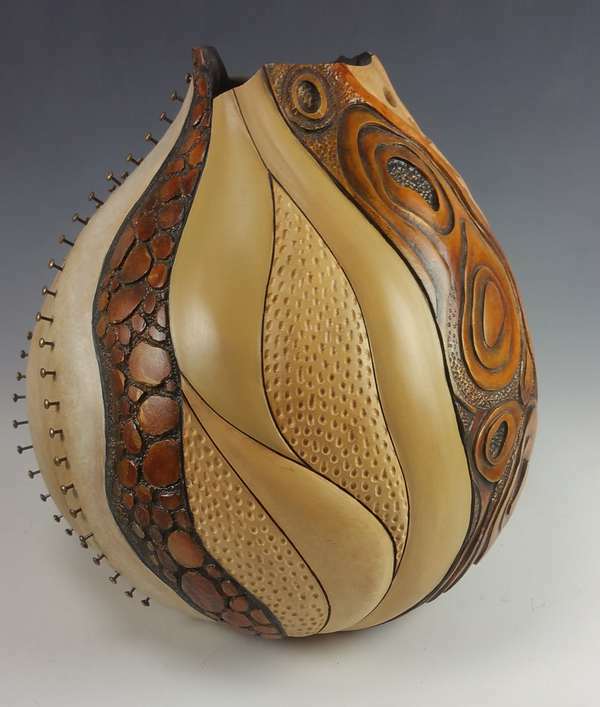 Bring a gourd - something in the 5-7" range is probably best if you want to finish your piece in class. The gourd should be at least 1/4" thick after cleaning. 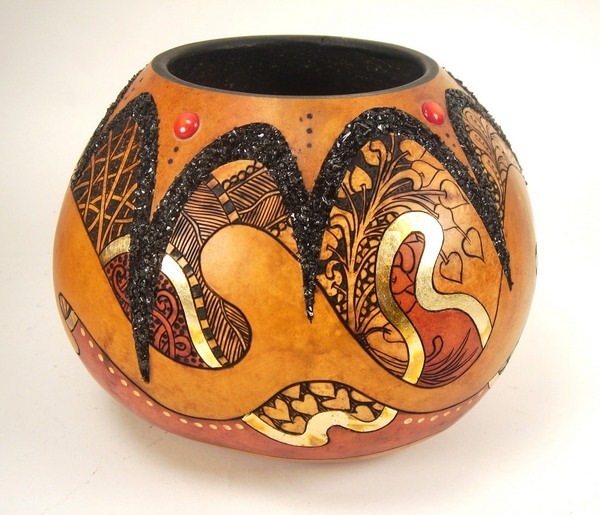 You may paint the inside of your gourd if you wish or paint it in class. Bring a dust mask or purchase one at class. Some dyes/paints and finishing supplies will be available for class use, but you are welcome to bring your own inks/dyes/brushes, etc. if you prefer to use your own. 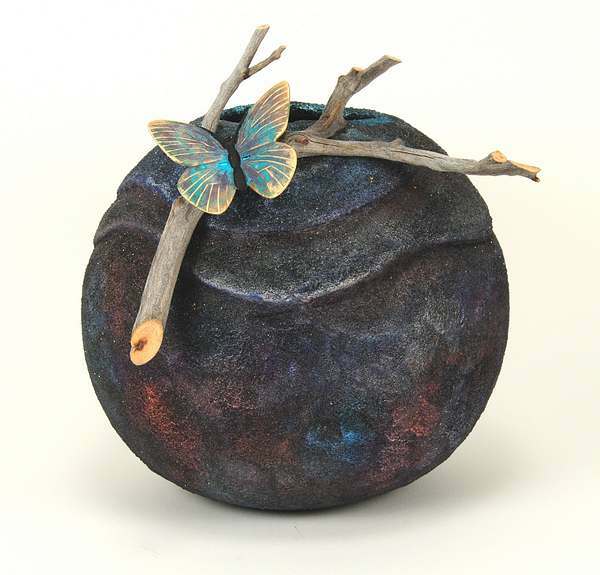 This class introduces 3 new textures - river rocks, 2 kinds of stylized waves, and pond ripples. You'll be able to design your own piece using these textures; everyone's project will be different depending on what they choose to do with the patterns. This class will show you how to lay out and carve the "Infinity Weave" pattern. Bring a power rotary tool (Dremel or other brand) and any burs you have on hand. 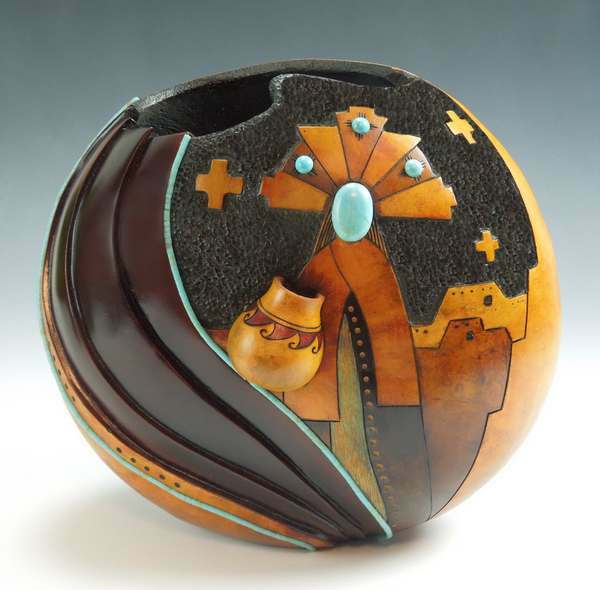 Bring a gourd - something in the 5-6" range is best if you want to finish your piece in class. 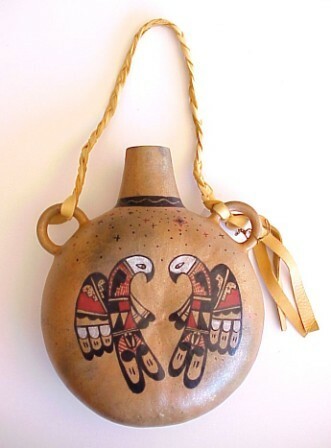 Clean the gourd inside and out; you may paint the inside of your gourd if you wish . Bring a dust mask or purchase one at class. Some dyes/paints and finishing supplies will be available for class use if you finish the carving.